Oregon's Gordon Smith and his wife, Sharon, hope reaching out helps keep other families from meeting the same fate. 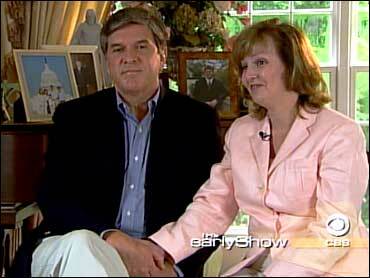 Their 22-year-old son, Garrett, took his life in 2003, after a long struggle against depression. Tracy Smith has their story. Politicians usually don't like to put their personal lives in the spotlight. But Sen. Gordon Smith and his wife, Sharon, are doing just that, in the hope other families can learn from the very private and tragic story of their son's suicide. The Early Show national correspondent Tracy Smith says the Smiths were a picture-perfect family, devoted to public service, their religion, and each other, until one terrible day when their son's darkest problem came crashing down on them. "He played football," Sharon told Tracy. … "He was an Eagle scout. … He just was an all-American boy … and had tons of friends." He seemed to be the perfect son, of a perfect father, a United States senator. "I just felt," says Gordon, a Republican from Oregon, "like I had failed as a dad. I'd been out trying to and, in some way, to save the world (through) public service. But, I failed to save my own son." "Had we known earlier," says Sharon, "I think we would have had a different result at the end. I do." Garrett Smith was the second of three children Gordon and Sharon adopted. Although diagnosed at a young age with severe dyslexia, he seemed happy growing up, Tracy reports. Then, when he was 17, Garrett "dropped a bombshell on us, that he was an alcoholic," Gordon says. Gordon and Sharon discovered that their son was drinking right in their own home. "Garrett had said, " 'It makes me feel like I can speak up far in class better,' " Sharon recalls, "that, 'I'm just more relaxed around the girls.' "
Garrett got help, and the drinking stopped. "At the time," Smith asked, "did you think, 'It's just a phase. This is typical'?" "(We thought it was) typical teenage behavior," Sharon responded, "and I think a lot of parents would think the same thing." But then, Tracy says, came another warning sign: A year later, on his application to be a Mormon missionary, Garrett admitted that he suffered from depression. "(I asked him) 'Why would you check that?' " Sharon told Tracy, "and he said, 'Well, because I'm depressed. And I am more and more all the time.' "
The Smiths were shocked. But Garrett insisted he'd be fine if he went away for two years. In fact, he was. But, Tracy says, when he returned home for college, he started drinking again, and seemed to fall into a dark hole. "He just started screaming out that he felt hopeless," Gordon remembered. "(He felt) his life was pointless, vain, meaningless. …He wished that his birth mother had prevented his birth. He wished that, that he could just go to sleep without waking up." The Smiths sent their son to a psychiatrist, who prescribed antidepressants. But he was spiraling down, faster than they knew. The message on his answering machine could have been the final alarm. "It just said," Gordon told Tracy, " 'This is Smith. I don't feel well. Do not call me anymore.' "
Then, Gordon described the moment when their doorbell rang: "The police are at the door. … They just said, 'We don't know how to make this easy. But your son was found -- dead in his apartment. And -- it appears to be a suicide.' "
The day before his 22nd birthday, Garrett Lee Smith swallowed a fistful of sleeping pills and hanged himself in the closet of his college apartment. Wracked by guilt, the senator worried that he'd put his political career ahead of his son. "Was I complicit in killing my son?" Gordon says he wondered, "because … I think I was a good daddy." "You were a great daddy," Sharon reminds him. "He loved you. And he was really proud of you. I'm sure of that." "You still have to tell him that?" Tracy asked. "Yep," Sharon confirmed. "I still have to remind him of that." Part of Garrett's note to his parents read, "Put me in the ground, and forget about me." "Well," Gordon remarked, "We haven't listened to him." The senator decided to ignore his son's dying wish, and his own instinct to withdraw from the spotlight. In an emotional speech on the Senate floor, Gordon said, "I didn't volunteer to be a champion of this issue, but it arose out of the personal experience of being a parent who lost a child to mental illness and suicide." A year after Garrett's death, President Bush signed the Garrett Lee Smith Memorial Act, authorizing $82 million in grants to help prevent suicide by young people. Among the things the funds were earmarked for: mental health screenings in schools. "We take our kids for physical vaccinations, dental exams, eye checkups," Gordon says. "When do we think to take our -- our son or daughter for a mental health checkup?" Sen. Smith has spent most of his career as a public servant, but it's his private pain that could be his most enduring legacy, Tracy Smith observes. "So," she asked Gordon, "to parents out there who watch this story and say, 'Well, that might be my kid, but probably not,' what would you say?" "If this can happen in our house, it can happen in your house," Gordon replied. Suicide takes the lives of more than 30,000 Americans every year, and is the second leading cause of death among college students. Sen. Smith calls it an epidemic. That's why he wrote a book about his son's life, "Remembering Garrett: One Family's Battle with a Child's Depression." Gordon and Sharon hope that, by sharing Garrett's story, other parents will catch the signs of teen depression much sooner. To read an excerpt of the senator's book, click here.